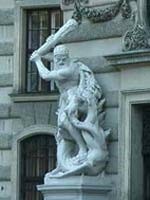 The beating, historic heart of Vienna remains the Innere Stadt (The Inner City). 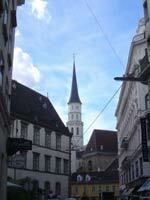 At its centre rises the ancient gothic cathedral of St. Stephens, whose spire has stood unbroken for centuries. It's here in the Innere Stadt - a largely pedestrianised zone - that you'll find much of the best that the city has to offer - shops, bars, cafes, restaurants and museums, as well as the Hofburg Imperial Palace. All the same, you'll be missing out on some 24 carat treasures if you don't stray beyond the centre. The whole of the Innere Stadt is encircled by a sweeping nineteenth century ringroad - the Ringstrasse - which follows the line of the old medieval walls. Along it you'll find some of Vienna's grandest institutions, such as the Rathaus, the Houses of Parliament, the museums of Art and Natural History and swish hotels such as the Imperial. Just a whisker west of the Ring lies the brand spanking new Museumsquartier, one of the world's most exciting cultural complexes. Further west, major crowd-pullers include Schonbrunn Palace and its fantastic Zoo, whilst to the south, the Belvedere offers a banquet for culture vultures. East of the Innere Stadt the Prater rises up, home of the historic fun park. It remains a much-loved favourite. Nearby you can track down the Ernst Happel soccer stadium, venue for the almighty Euro 2008 clash. To the north, Grinzing - once a picturesque parish in its own right - is the nexus for Vienna's Heuriger culture. The wine taverns here offer a quintessential Austrian experience. We're only just getting our fork into the Viennese cake thus far, but don't dismiss a trip out of town if you've got time. Close to Vienna, the spa town of Baden is a pleasant spot, whilst the monastery of Klosterneuburg is a long-established pilgrimage venue. Further afield, wine lovers should head for the Wachau region, which begins seventy kilometres northwest of Vienna. Here the monastery of Melk offers a stupendous sight, whilst the ruined castles of Aggstein and Durnstein will inspire romantic souls. The wine centre of Loisium, just on the fringe of the Wachau, is a modernist marvel with a hip hotel on hand for your hangover.